This year’s harvest has started, with 2 big days on the Sauvignon grapes which all ripened at the same time. 400 hectalitres (that’s 40,000 litres) in 2 days! The order of ripening and picking is always Sauvignon first, then Merlot, then Cabernets and we’re hoping for a dry September. We’re delighted that the Guide Hachette 2019 has awarded 2 stars to our Merlot Cabernet 2016. This follows the Silver medal awarded in Paris earlier this year. Our winemaker Mathieu describes it as “Vibrant and intense with fresh fruit aromas. Soft, juicy, succulent and long-lasting flavours with a delicious weight of pure ripe fruit and a smooth, velvety texture”. If you haven’t tried it yet, we have stock in the UK, at Calais and at the vineyard. The grapes are ripening beautifully at the vineyard and it was touch and go whether we begin the harvest this week. But Mathieu’s decided that the Sauvignon grapes will benefit from a few more days under the clear sunny skies, so the Grand Mayne harvest will begin in earnest next week. The order of ripening and picking is always Sauvignon first then Merlot then Cabernets and we’re hoping for a dry September. That means of course that there’s one more chance to enjoy the last summer Friday barbecue this Friday! Let’s get this over with first…we love using natural cork for our Reserve wines. But despite lots of reassurances from the cork industry that they are solving the problem of corkiness in wines, we continue to experience very occasional problems. Having gone to lots of trouble to look after the grapes and make great wine, it’s really upsetting for us to think that your enjoyment might be spoiled by a fault in the closure, so you’ll notice a change in the 2016 Reserve wines as we are using a closure which is becoming increasingly popular called “Diam”. So what causes corked wine? It happens when the cork is infected by a substance called trichloloanisole(TCA), which can be transmitted from cork or even wood such as pallets in the winery. The result is a corky, musty smelling taint of differing degrees. The other problem with natural cork is the natural variation between different corks in porosity to air, which can lead to extreme variations in oxidation of the wine. This has been particularly noticeable in white burgundy, but can also be apparent in our white Reserve which has much in common with those great wines. The Diam process chops the cork into tiny pieces and uses carbon dioxide to remove any traces of TCA, in the same way as caffeine is removed from coffee. It also sorts the superior, highly elastic suberin component from the less elastic lignin which is discarded. It then mixes the suberin with microscopic spheres of the same substance that’s used for contact lenses, which fills the voids between the cork particles reducing the porosity to air and increasing elasticity. Finally the pieces are mixed with a glue and moulded under pressure. Phew! You can look out for Diam’s in the fabulous 2016 Reserve wines which will be released in the UK next month. Big thanks to Peach Pub Group who are offering our fabulous 2017 Rose as Wine of the Month! Silver medal winner in Paris earlier this year, you can try it at any of the Peach pubs here. Our 2016 Reserve red and white wines, both Gold medal winners in Paris earlier this year, will be released for tasting at the vineyard BBQ tonight. More news for UK & Calais collections in a few weeks. Surviving frost and one of the smallest vintages for years, the 2017 Sauvignon is a sublime white with mouthwatering freshness and a lovely mineral intensity. Get 10% off on all orders in July. It’s a must for summer drinking. Don’t forget to Log in when ordering to see your special prices. The London Sommelier wine Awards have given our 2016 Sauvignon a Gold medal. The Sommelier Wine Awards is a wine competition with a difference. As Britain’s only on-trade wine competition, it focuses entirely on wines aimed at the on-trade. The SWA judges all serve or buy wine for their venues in the on-trade, or are leading consultants, so it’s especially pleasing to win Gold. Well done to Mathieu and the team. We’ve added another award – one of the top attractions in the area for our Friday night BBQs at the vineyard in July and August. With food from the best butcher in Duras, wine from the vineyard and music from great bands to dance under the stars, what better way to spend a summer’s evening? Of course we will be repeating the evenings this summer. Starting with decisions regarding the quality of the grapes from different parts of the vineyard which can vary from year to year, the Réserve wines at Grand Mayne get the very best treatment. Selection is followed by a choice regarding oak barrels which can come from different countries and coopers, each of which will provide a different character to the wine. We buy from a number to ensure the right balance. Its also important to decide how many new barrels to use alongside those that we’ve used in earlier years. Regular tasting then determines just how long the wine should be left in barrel. The following is a brief summary of what’s changed each year recently in the making of Domaine du Grand Mayne Reserve white. All the wines are fermented and aged in barrel. In 2011 : Mathieu added a bit of Sémillon to the Sauvignon. There was also a little less new barrel (between 1/3 and ¼), and the wine was left for one year in barrel. The 2011 is lower in acidity as a result of the hot dry weather so this wine needs to be drunk over the next 12 months. 2012 was the year in which Mathieu really took over, and he selected some different barrels as he wanted less oak flavor and and more freshness. Sémillon and Sauvignon were both excellent. in 2012 : with a beautiful balance. Ageing was during one year as with the 2011 and Mathieu believes this vintage can be aged for a long time. In 2013 : Batches of grapes were picked before the hail that devastated the harvest in 2013 so quality was again good, but maybe not as complex as 2012. One year in barrel and a bit less acidity but good richness too. In 2014 : The Semillon wasn’t as good as in 2012 and 2013, so this is more Sauvignon. We also left the wine in barrel for a few months less to improve balance and retain that all important freshness. In 2015 : The Semillon was still not at the same level as in 2012, but the Sauvignon was fantastic with richness and complexity. We also introduced bigger barrels of 400 litres and new suppliers and left the wine in barrel for just 6 months. We also added the Sauvignon from a new part of the vineyard on limestone, into the blend. 2011 : My first vintage and true to say a familiarization vintage for him so not the best example of this wine. It’s still quite good though with dry fruits, almond, dry Corinth grapefruit, and honeysuckle. And also a buttery character. A bit heavy but still fresh and well balanced. Click here to order. 2012 : Amazing ! Complex. Citrusey, dry fruit, candied fruits, flowers (honeysuckle), white fruit (dry pear) , mineral, rich, fresh, amazing balance. Nice acidity, long and saline vibrant. Click here to order. 2013 : Much the same in many ways to 2012 but a little bit lighter and less complex. Very nice balance though and a bit more sweetness at the end. Click here to order. 2014 : Different to previous vintages with more fresh citrus fruits but perhaps less complex at this point in its development. More on the fruity side which will please many. Rich round and well balanced. Click here to order. 2015 : Perhaps the best Reserve white so far. Citrus, white fruits, citrus skin, flowery and mineral. Outstanding balance, acidity, and richness. Long and fresh. Staying so long in the mouth. Click here to order. So everyone seems to love Sauvignon. And the 2015 and 2016 vintages of the unoaked Sauvignon certainly seem to hit the spot for summer drinking with their vibrant fresh fruit aromas and flavours. But every year we separate out the best grapes for an altogether different wine; an altogether more serious relative. Sometimes we add a little Sémillon to the mix, sometimes it’s just Sauvignon, and the low yielding grapes are carefully and lovingly fermented and aged for some months in the very best oak barrels we can find. In the past we were perhaps guilty of a little too much oak, but since 2012 the emphasis has been on the lovely fruit we get from the grapes, which we want to use the oak to wrap in a creamy layer of soft texture. Recent vintages are amongst our own favorites but despite that, this is the wine we sell the least of, so we have decided to give everyone the opportunity to try these wines at a great price for a few weeks only. Reminiscent of top white wines from Pessac, with floral aromas and vanilla notes. Flavours of white fruits like pear, and some subtle hints of citrus and honeysuckle. Fresh and well balanced. The perfect wine for those looking for Sauvignon freshness but more complexity. Now available with a 20% discount off your special prices until 31 May 2017. Click here to order. 2012 was a great vintage in the area for dry whites as all early ripening grapes were excellent, with only the Cabernet failing to reach full potential. Each year we select one parcel of the top quality Sauvignon Blanc grapes to be vinified to make this cuvée of white wine. These grapes are left on the vine to ripen for a few more days after the normal white wine harvest. Then they are carefully picked by hand and go straight to the winery, where after several hours skin maturation, they are carefully pressed. The juice is left to settle and then run into new oak casks to ferment. After fermentation the wine is stirred from time to time over a period of several months to increase the complexity. It’s bottled in the March following the vintage. This week it was replacing stakes, and mending the tractor that took up much of Fifi and Manu’s time, but we’ve all also had frost that has damaged our neighbour’s vines, but luckily only a small portion of ours at the bottom of the hill. We’ll have more news of this next week. Others have not been so lucky with Chablis, the Loire and Champagne already feeling the full effect and a big loss of grapes because of late frosts for the second year running! The one bedroom cottage at the entrance to Domaine du Grand Mayne is newly renovated and available for rent throughout the year, with a minimum stay of just one night. And it’s yours for free for the night if you fill your car boot with our lovely wine. Buy 120 bottles of any of our wines and your night in the little stone barn is on us. Click here for more pictures or here for more information and availability. As the Chancellor has seen fit to make drinking more expensive, we will have to increase our prices to you by the rise in duty in the latest budget, 10 pence per bottle including VAT. This makes Calais collections even more attractive as the Euro price has remained the same and you don’t pay any duty. The 2015 reds will be amongst the best, if not the best that Grand Mayne has produced. The Merlot Cabernet 2015 is juicy and soft and perfect for summer drinking. The zingy 2016 Sauvignon and delicate pale Rosé are really fresh and will provide great pleasure throughout the year. These wines are all now in bottle, and can be ordered for delivery to your door in the UK, or for collection from the vineyard or Calais. Click here to order and see Mathieu’s tasting notes (log in for your special prices). An exclusive gathering of cigar afficianados enjoyed an extremely convivial evening at the Bulgari Hotel in Knightsbridge on Tuesday evening, smoking classic hand-rolled Cuban Davidoff cigars accompanied by a delicious dinner with Grand Mayne wines. Starting with our delicious sparkling Rosé as an aperitif, we moved on to the Sauvignon 2015 with the starter, and the Réserve Merlot Cabernet 2012 and Réserve Sauvignon/Sémillon 2012 with the main courses. We finished with our new dessert Moelleux 2012 which was enjoyed by all. A great gathering of 60 celebrated the 2016 harvest with gourmet lunches, dinner and dancing after having picked grapes to make 2000 bottles! This year’s harvest will end around the 20th October with perfect weather, sunny and warm by day and chilly at night. The yield is high and the quality very good. The whites are well balanced with a lower sugar level than last year and the reds have superb colour and will be another great vintage. Congratulations to Mathieu and the team on our first bulk sale to China, with an order for 11,340 bottles of Reserve Merlot Cabernet 2012. China took another step to becoming a wine superpower last week when they came top in a blind tasting competition in Provence, beating 21 nationalities including the French to take first place. We’re proud to announce our 2 star award for our 2014 Merlot Cabernet in the Guide Hachette. Congratulations to Mathieu and the Grand Mayne team on this great party wine, which is a veritable basket of fruit for the nose and palate, with spicy hints and subtle tannins. It’s amazingly soft and appealing. It’s now easier and quicker to place your orders on-line. With our full range of wines all drinking beautifully and all available to order in our shop, click here to see the full range. Login using your email address and password to see your discounted prices. If you’ve forgotten your password, click here to re-set. Despite Brexit, it’s full steam ahead at the Anglo/French alliance of Domaine du Grand Mayne, with our only immediate concerns relating to exchange rates and the impact on the price of wines in the UK. For now we’ve decided to keep UK prices unchanged, making the wines even better value, and it’s also a great time to save some extra pennies (or euro’s!) by collecting from our Calais warehouse. Visiting is great at any time of the year but there’s no better time to be there than during the harvest. The Harvest Event is on the 24/25 of September, with long lunches, lively company and gourmet dinners. You can also really be involved in the production of this year’s wine. Grape picking, tasting fresh pressed juice, discussing the impact of weather on the style of the wines, and all against a backdrop of long lunches, wine, great company and a Saturday night celebration of gourmet food and dancing under the moonlight! Click here to find out more. The President of the Royal Choral Society is HRH The Duke of Kent who last year celebrated his eightieth birthday. It was decided to hold a concert to mark this and the many years of service that the Duke has put in on behalf of not just the Royal Choral Society but many other charities throughout the UK. It was also thought that it would be a good idea to make it a party for the choir, their families and friends and choir supporters who faithfully attend our concerts – as a way of saying “thank you” for your support. And so on 12 May in the Great Hall at Central Hall Westminster the choir entertained their guests to a delightful concert, preceded by a wonderful reception and followed by a further reception with delicious “puddings”. The wine flowed, even on Methodist premises, and it was of course supplied by Domaine du Grand Mayne with specially printed labels marking the occasion – and delicious it was too! The team have had their challenges so far this year, and there’s no doubt that the bad weather during blossoming will result in a smaller harvest. We’ve been luckier than many others though who have been really badly hit by the frost and hail. In the last few weeks the sun’s come out and its been very hot , and much of the vintage comes from the weather over the coming months. Whatever this year brings, we’ve got some fabulous wines from the 2015 vintage in tank and barrel to look forward to! All the new bottlings of the unoaked varietal wines will provide you with some great summer drinking. The 2015 Sauvignon is ripe and pure, the Rosé is delicate, fresh and dry, whilst the 2014 Merlot Cabernet is luscious and soft. But we’re also really fond of the 2014 Sauvignon. And if you want to grab a bargain we’ve reduced the price on the last few cases by €1 a bottle in Calais. If the reserve wines are your thing, then you’ll find that the 2012 vintages of both white and red are drinking beautifully. The big relief in the vineyard last month was that we missed the devastating frosts that hit the Loire, Chablis, Macon and Burgundy. The damage a late frost can do is unrecoverable as it kills off the sprouting buds and with it, that year’s harvest. There’s a long way to go yet in 2016, but everyone’s been busy making sure that the whole vineyard, including the new vines planted last winter, are in great condition. Our fingers are firmly crossed for another great vintage. Meanwhile, in the cellar Mathieu will be checking to see if racking (see below) is necessary, and getting ready to take the 2015 Reserve white out of barrel. Martin Meinert reckons that the Sauvignon from the limestone soils is the best he’s tasted from Grand Mayne, and the Sémillon is also excellent, so hopes for this wine are very high at this stage. The 2014 Reserve white is also excellent, with balance and complexity. Of the Reserve reds, the 2014 is about to be blended using some exceptional Merlot and Cabernet Franc and Cabernet Sauvignon. The 2015 to follow is promising to be spectacular and amongst the very best in 30 years of Grand Mayne. Deeply concentrated Merlot, beautifully ripe Cabernet Franc and powerful and complex Cabernet Sauvignon will provide some fabulous ingredients for Mathieu and the team to weave some magic. Racking: or soutirage is a traditional method in wine production of moving wine from one barrel to another using gravity rather than a pump. The process is repeated when the casks are moved to the second-year cellar. Soutirage was developed in the Bordeaux region of France in the 19th century at a time when there was no electricity to power pumps and many estates in the area still employ this labour-intensive method. During aging, the wine is decanted several times from barrel to barrel, with tiny amounts of oxygen softening tannins. The process also helps clarify and freshen the wine by removing the fine lees or sediment. You’ll find Grand Mayne wines now in pretty well all of the local restaurants in Duras as well as an increasing number further afield like the Michelin starred La Tour des Vents near Bergerac where we’re often the only Duras wine on the list. Closer to home you can order Grand Mayne at an ever increasing number of great restaurants and Gastro pubs. We have your Christmas all wrapped up this year at Domaine du Grand Mayne. 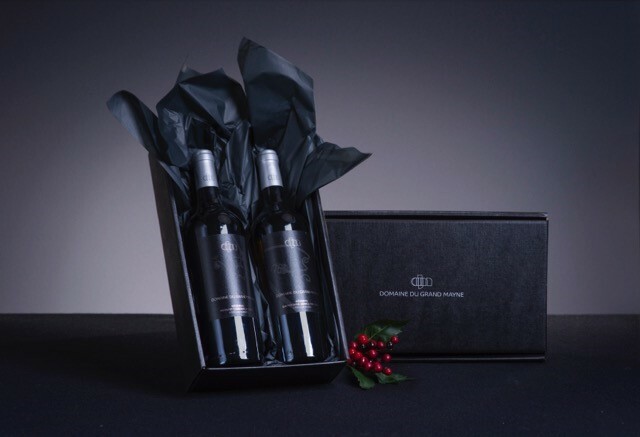 You can choose from our range of great wines presented in luxurious gift packs plus the opportunity to *personalise your labels with a special message. Alternatively we can hand write your message on one of our distinctive Grand Mayne cards, and deliver your gift direct. Please note the minimum order for all our gift packages is 12 bottles (in any combination). The following is a small selection of recommended gifts, but we can also tailor to suit. Grand Mayne bottle fermented Sparkling Rosé. Soft red fruit flavours, with a gentle touch of sweetness. Packed in an elegant branded black gift case @ £11.50. Domaine du Grand Mayne Revolution 2009. Our top powerful yet subtle Merlot, aged in oak. Fresh, clean white and fruity red wines. Domaine du Grand Mayne Réserve Sémillon Sauvignon 2012. Only the very best hand picked grapes from each vintage, aged in oak. 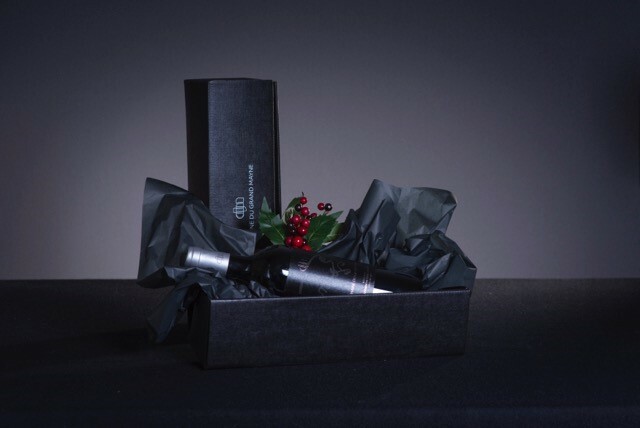 Gift boxes are available UK only, but if you buy wines in Calais or want your own wine selection, we can supply the gift boxes separately to you for £2.40 per single and £3.60 per double. If you want personalised labels, we must have your order by 20 November to ship in time for Christmas. For more details or to customise your order, please ring Richard in our Ashe Park office on: 01256 772898. Bulk delivery of gifts will be quoted separately and will be charged at cost. Minimum order for all our gift packages is 12 bottles. *Personalised labels subject to a minimum label cost of €50 (£35). Wine makes a great gift at any time, but wine with your message on the bottle must make for the perfect personalised Christmas gift. Here at Domaine du Grand Mayne we can turn an already fabulous wine into something even more memorable with a message of your choice on the label. Order before Nov 20th for delivery to any address in the UK or collect from our warehouse in Calais, to make your gift one that will not be forgotten. The choice of message is yours but we advise keeping it brief so that it looks good on our minimalist designed labels – perhaps ‘Merry Christmas 2015’ across the top and if you are thinking corporate then the name of your company along with the logo in the bottom corner? Whatever you want we will try and accommodate it. However, time is running out so we need to know what you require along with which of our superb wines – our fresh, dry white Sauvignon, our pale pink Rosé or our soft, juicy and smooth Cabernet Merlot – you wish to personalise. In the UK our varietal wines cost just £7.95 (inc.VAT) including delivery, and personalising them is just 20p a bottle more. However, if you fancy a trip to Calais then you can save on duty and each bottle will cost just €5.83 (approximately £4.16) plus 20 per bottle for personalisation. To discuss your requirements and to place your order, please ring Richard Boden now on: 01256 772898 or email: Richard.boden@grandmayne.net. Don’t forget the absolute deadline to personalise your presents this Christmas is November 20th. Small print: All prices and personalisation, subject to a 12 bottle minimum. Personalisation subject to a minimum cost of €50 (£35). Christmas! It is closer than you think – around eight weeks in fact. Are you ready? Presents wrapped? Tree ordered? Menus prepared? Wine bought? Obviously we can’t help wrap the presents or trim the tree but we can help with the wine either as a gift or for your own enjoyment. No problem. You could be buying some of our fantastic wines for as little as £4.25 per bottle if you fancy a quick trip to France! Choose from our range of fresh dry whites, pale pink rosés or succulent reds all produced by our wine maker Mathieu Crosnier and a small dedicated team in the rolling fields of the Côtes de Duras in France. You can save duty on our award winning Sauvignons, our delicate perfumed Rosé or our soft juicy and smooth Cabernet Merlot by picking them up from our warehouse in Calais. Wines cost £3.70 less when you pop over the Channel to Calais. You get the same £3.70 saving on our Réserve Range of aged Sauvignon Semillion 2012 or Merlot Cabernet 2011 that come in at just £7.25 a bottle. And to get the party started, don’t forget our Sparkling Rosé – a Grand Mayne favourite fresh with fine bubble and a refreshing taste of strawberries priced in Calais at just £6.60 a bottle. And there is no better time to travel now that the ferries and tunnel are off peak with ferry prices starting from as little as £35 each way (approx. 90 minutes) and tunnel prices from as little as £30 each way (approx. 35 minutes). There are also bargains to be had. Head for the village of Coquelles to visit Cité Europe and for designer bargains Marques Avenue Factory Outlet may be just the ticket. And finally stock up your larder French style with jams, meat, charcuterie and fresh seafood. Check the prices for our whole range before ordering online and collecting from the very friendly family run English speaking Franglais Vins which is a short seven minute drive from the ferry terminal and only a two minute drive from the tunnel. They are open seven days a week and as well as stocking Domaine du Grand Mayne wines you can take the opportunity to stock up on beers and ciders. But if none of this is for you then you can order now for free delivery to anywhere in the UK any of our wines starting at just £7.95 a bottle for the Varietal Range or if you fancy a treat for Christmas just £10.95 for our Réserve Range. And if you want to get the party started then opt for our Sparkling at just £8.99 a bottle. The tunnel crossings can be booked here. We’re delighted to let you know that our online shop has launched and people are already buying their wine online. It’s really simple… go to http://www.domaine-du-grand-mayne.com/ and hover over ‘Shop’ in the main menu. You’ll get three options: UK Shop (to have it delivered to your home or collect from our offices), Calais Shop (to collect your wine at Calais) and Vineyard Shop (to collect your wine from our vineyard). Pick whichever you want and start shopping! There’s nothing worse that sitting at a wine tasting listening to everyone around you enthusing about tasting apples when all you can taste is… well… wine! Is being able to taste all these flavours the sign of a real wine expert, or something that one can learn? A recent article in The Telegraph (19th September 2015) reported on a controversial new study that stated that the taste of wine varies greatly, depending on the size of the sip taken. According to the scientists behind the research, this is because wine releases different quantities of chemicals, known as volatiles, in the mouth depending on the volume of liquid tipped in. These chemicals influence the way it tastes. We all know that the smell of wine is important and it does, indeed, influence the way we experience the taste of wine. However, the researchers found that human saliva fundamentally changes the way volatiles are released from wine, producing quite different flavours in our mouths than we would expect from smelling the wine. This explains why, sometimes, we smell something very different from the eventual taste. As you would expect, this research has caused a stir within the wine community. Many commentators have suggested that it will change the way wine tasting is conducted in the future. However, Victoria Moore, the Telegraph’s wine critic, made a valid point when she said that it would be very hard for drinkers to accurately regulate the amount they took with each sip for it to make any meaningful difference. But what impact does (or should) this have on your glass of wine at home? Day-to-day, probably very little. However, this study suggests that you could enjoy far more sensory pleasure from your glass of wine simply by varying the size of your sips. The researchers recommend small sips to taste baked apple, apple pie and floral flavours associated with Chardonnay, Semillon, and Sauvignon Blanc, while larger sips detect the flavour of berries, cherries, grapefruit and honey. We’d be interested to hear your views on this, and the flavours you can taste in Domaine du Grand Mayne wines, depending on how you taste them. Full details of the research can be read here. Here at Domaine du Grand Mayne we believe that our vineyard community of friends, shareholders and supporters is one of the things that makes our wine taste that little bit better. That’s why we’d like to offer a gift from us to your friends. You can now invite your friends to enjoy outstanding wines direct from the vineyard at great prices. Simply forward the email sent last week to a maximum of six friends between now and the end of October and they will each save £38 from a special mixed taster 12 bottle case of Grand Mayne wines (list price £113.00) which have been made with care and passion by our small dedicated team. All they need to do is click here and use Promotion Code TRYGMSAMPLE at checkout. NB …by ordering now, they will also qualify for all the benefits of the special friends and family membership, which include discounts and exclusive events. We feel really guilty mentioning Christmas when it’s only just October, but with wines for both everyday drinking and special occasions we wanted to provide you with plenty of time to plan both your own drinking and wine gifts this Christmas. This is especially important if you want to save lots of money by collecting wines for you and your friends from Calais. Buying from Calais can typically save you around £30.00 a case, and it couldn’t be easier, with our Franglais Vins warehouse just 5 minutes from the tunnel exit. And we’ve had lots of reports lately which confirm that there are currently no delays or problems at Calais to deter you. Current rates are £30 return with P&O or £60 on the tunnel. There’s also still time to order personalized labels by calling Richard Boden on 01256 772898. We’ve got really high hopes that the first vintage we’ll be making under our new ownership will be one of the best ever at Grand Mayne. The balance of the whites between acidity and alcohol, which were picked early in September, is very good, and early signs are that the wines will have the fruity character and freshness that we’re looking for. We’re also delighted with the concentrated juicy fruit from both the Merlot and the Cabernet Franc, and there’s every sign that the Cabernet Sauvignon which is the last to be picked will be every bit as good. All those who came to help at the grape picking festival over the weekend of the 26th and 27th September not only helped to get the harvest in under clear blue skies, but were also the first to taste the succulent fresh juice as it went in to the tanks. Picking of Cabernet Franc was followed by a perfect vineyard lunch washed down by copious quantities of Grand Mayne wines. Then following a much needed siesta, it was back for a five course supper and dancing under the stars until well after midnight. Sunday (with some slightly bleary eyes), was brunch, winery and vineyard tours. A big thanks to all who made the journey and a date for diaries for next year’s event is 24th and 25th September 2016. We’re delighted to confirm details of the November events in Manchester, Bristol and London, which will be hosted by our winemaker Mathieu Crosnier, focusing on the best flavours and foods to ensure maximum enjoyment of Grand Mayne wines. We’ve selected some great venues, and each chef will be liaising closely with Mathieu over the coming weeks to ensure some outstanding menus. We’ll also make sure you taste some of the very best of recent vintages and get first hand knowledge of this year’s vintage too! Please do bring friends so that we can introduce as many people as possible to Mathieu and the wines and please reserve your places asap to avoid disappointment. Just email Richard.boden@grandmayne.net with the number of people and venue, along with a contact number so Richard can call you to take a card payment. Price at each venue including a sumptuous four course supper and all wines is only £69 per person. Any profits go to our chosen charity Action Against Hunger. 2nd November Hotel Gotham, Manchester (special room rate of £149 also applies at this venue). The restaurant at Hotel Gotham had to be good to compete with the rest of Manchester’s fantastic foodie scene. So they’ve created a restaurant with atmosphere, a menu with a bit of edge, full of local seasonal produce. The Glassboat restaurant is, and always has been, that rare combination of style and substance. Its unique waterside location and elegant interior are matched, if not surpassed, by the quality of dishes created on board. Situated in Kings Place alongside Regent’s Canal, Rotunda bar and restaurant serves honest, seasonal food centred around the beef and lamb from its own farm in Northumberland. With its own private dining room and waterside terrace it’s the perfect place for a party, dinner or alfresco drink. 7 pm tasting. 8 pm dinner. Please contact us if you would like us to advise on accommodation. Whilst the sun is still out and it feels like summer there’s no denying that a crisp glass of rosé wine can hit the spot like nothing else. We spoke to Mathieu Crosnier, winemaker for Domaine du Grand Mayne since 2011, and General Manager of the company in France, down at the vineyard, about the things he likes to eat with Domaine de Grand Mayne’s glorious 2014 Rosé. “Many things can be good with rosé”, said Mathieu. “One of my favourite things to eat is late summer tomatoes. And whilst I wouldn’t normally recommend an English chef over a French recipe, this Tomato Tart by Jamie Oliver is really great and easy to make. 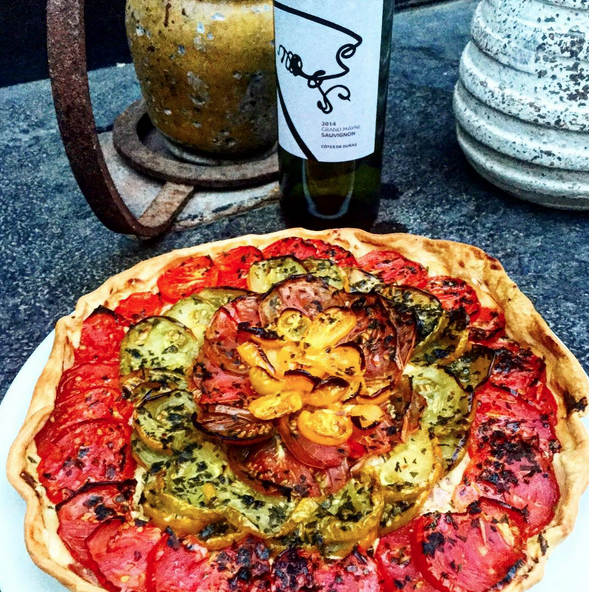 This beautiful tomato tart also works well with our 2014 Sauvignon. “If you’re after something a bit more summery, however, you can also add a bit more mustard on the pastry and even some thin, dry ham on the top. Some of my favourite types of tomatoes to eat with rosé wine include Heart of Ox, pineapple tomatoes, Green Zebra, Rose de Berne, Black Krim and small cherry tomatoes. 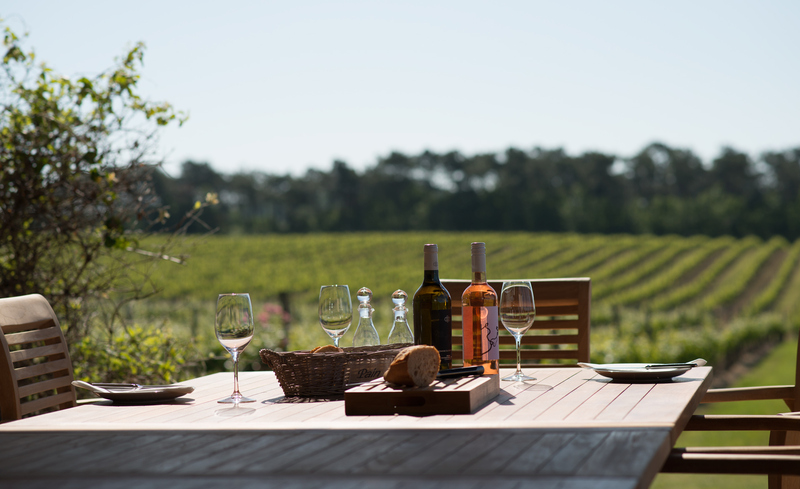 You can read more about our rosé wine here… and whilst it says it can be kept for one or two years, we suspect it won’t see out the summer, once you taste it! Whilst it might have been a wet and windy summer here in the UK, down on the Côtes de Duras France has been experiencing its third hottest summer since 1990 – and that’s good news for the wines produced from this summer’s harvest. Whilst Mathieu and the team have had a hard time making sure things didn’t dry out too much, the heat has produced really healthy vines, drying up any hint of the dampness that can lead to fungus diseases and a negative impact on the grapes. We’re keeping everything crossed that we get exactly that… and we’re looking forward to this year’s crop as exceptionally good quality. We will keep you updated as the summer heads towards harvest. On 9th August 2015 Domaine du Grand Mayne was proud to take part in the annual Côtes de Duras wine fair. Situated in the midst of the walled medieval city the day is full of festivities celebrating the wine of the region. Run for 24 years and attracting over 15,000 people, this single day offers visitors to the region vineyard visits, music and a chance to taste of 150 of the local wines. Earlier this year we were awarded Ambassador status by the Appellation Côtes du Duras, winning 4 distinctions for our Sauvignon 2013, Reserve white 2012, Merlot Cabernet 2012 and Reserve red 2011. We were pleased to be able to play a big part in the day’s festivities with tastings and a chance to enjoy some amazing music, wine and fun. News of awards, harvest and other things going on at the vineyard in August. Véraison is a viticulture (grape-growing) term meaning “the onset of ripening”. It is originally French, but has been adopted into English use. The official definition of véraison is “change of colour of the grape berries.” This month we’ve been checking that this maturation has taken place successfully and the berries have an increasing amount of sugar in them. Following several weeks of heatwave, we’ve also had some much welcome rain. This has meant the team spending time checking all the vines to make sure they have remained free from disease. In the cellar we’re working hard to organise things for the harvest. Fifi is fitting the harvest machine and we’re all planning the weekend for when our shareholders visit, as well as preparing barrels to rack the 2014 white and red wines. Hector has joined the team to help out, as things get busier. He has been working on personalised labelling as well as running tastings in the shop. We’re looking forward to hearing the results of the latest Hachette guide. We’re confident that we have received some awards but won’t know the number of stars, or the wines chosen until the end of August/beginning of September. If you have not previously had a chance to enjoy our wines, we would love to send you a sample mixed case of 12 bottles. The price is £95, including delivery within the UK. You will receive: 2 x 2012 Merlot Cabernet, 2 x 2014 Sauvignon Blanc, 2 x 2014 Rosé, 2 x 2011 Réserve Merlot Cabernet, 2 x 2012 Réserve Sauvignon Sémillon, 1 x Vendange Tardive (Dessert) 2005, 1 x Sparkling Rosé. The harvest event at Domaine du Grand Mayne was one of the highlights of the event calendar for many years and now it’s back! On the morning of Saturday 26th September you can pick up the secateurs and get grape picking before lunch and the obligatory glass or two of Grand Mayne wine. Having joined in with the harvesting, you’ll be able to relax later in the day in convivial surrounds with a celebratory meal and a steady flow of delicious wines. On Sunday 27th you can shake off the cobwebs and join us for tours of the vineyard, a tutored tasting with Mathieu and brunch. The price for the weekend to include all food, wine, and entertainment is just £125 per person and that includes a small contribution to our favourite charity Action Against Hunger. You may like to drive down and load up your car with your winter drinking but there are also plenty of flights available to Bergerac airport (30 mins), Bordeaux (75 mins) or Toulouse (120 mins), and we have a list of recommended gites and hotels that we can forward to you or you can find on our web site – click on the link below. Places are limited however so if you’d like to join us please contact Richard on 01256 772898 to reserve your place. We’re thrilled to see how popular the beautiful villa is at Domaine du Grand Mayne. If you’re interested in staying there we’re taking bookings now. You can download our new brochure by clicking on the image below. Last night we were delighted to be involved in the Action Against Hunger Too Many Critics event at the Merchants Tavern, Shoreditch. Domaine du Grand Mayne has chosen Action Against Hunger to be our charity partner this year. 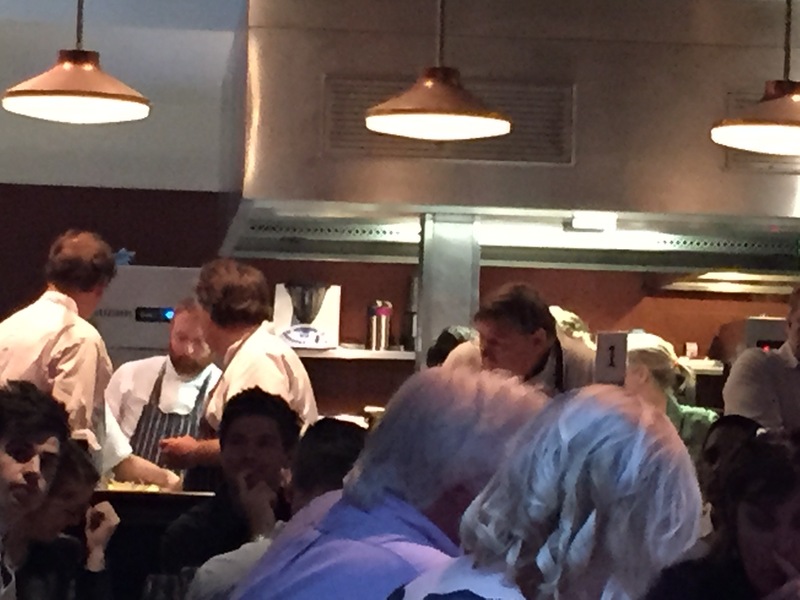 This year the critics were put through their paces preparing a meal at Merchants Tavern under Michelin starred chef Angela Hartnett’s strict direction! Cooking for guests including many of London’s top chefs, Domaine du Grand Mayne helped the charity raise well over £30k. A week end at the guest house in the vineyard was bought for £4000 and Angela Hartnett helped the bidding by offering to cook at the house for the winning bidder! 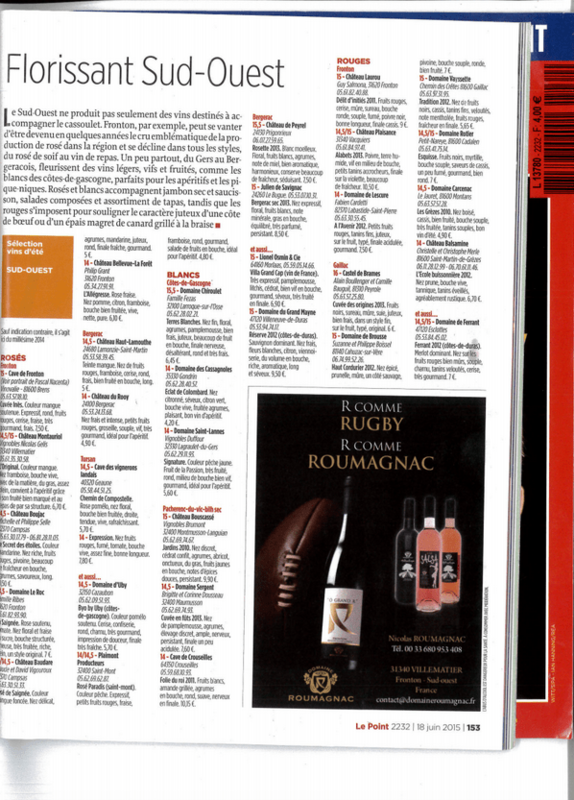 We were thrilled to see our 2012 Réserve Sauvignon Sémillon selected by Olivier Bompas and Jacques Dupont to be part of Le Point’s “summer wine guide”. You can read the review here and buy the wine by calling Richard in the office.